Thank You Abba Father that I can come at any possible moment and humbly bow before Your throne of Grace, where I can obtain mercy. Thank You that Jesus is at Your right hand, interceding on my behalf. Lord, You are an all-powerful and all-knowing God and I trust You for my daily provision. I trust in Your promise, Father God, that my needs would be met. I will wait patiently oh Lord, and will not be anxious about what is in store for me. Abba Father, I place my complete confidence in You. Job 42:2 – I know that You can do everything, And that no purpose of Yours can be withheld from You. 1 Chronicles 4:9-10 – Now Jabez was more honorable than his brothers, and his mother called his name Jabez, saying, “Because I bore him in pain.” And Jabez called on the God of Israel saying, “Oh, that You would bless me indeed, and enlarge my territory, that Your hand would be with me, and that You would keep me from evil, that I may not cause pain!” So God granted him what he requested. 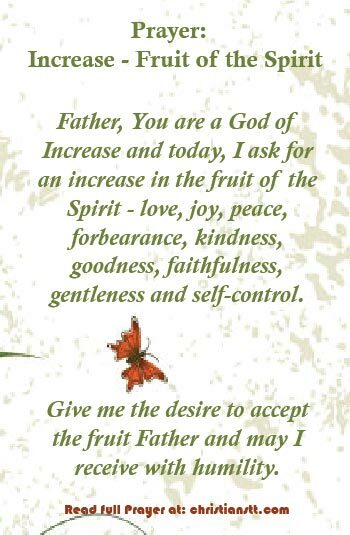 Father, You are a God of Increase and today, I ask for an increase in the fruit of the Spirit – love, joy, peace, forbearance, kindness, goodness, faithfulness, gentleness and self-control. Give me the desire to accept the fruit, Father and may I receive with humility. I pray Mighty and Merciful God, just as Jabez did, that You would bless me and enlarge my territory. That Your hand would be with me, and that You would keep me from evil, that I may not cause pain. I also pray that You would prepare my heart, my level of fitness, my education and my environment and any other area necessary to receive Your provision. May Your roots go deep within me as I prepare to handle the provision and growth, with grace. Lord, by receiving these blessings, I trust that my relationship with You and my family members will not, in any way, be contaminated. 1 Corinthians – 15:56-58 The sting of death is sin, and the strength of sin is the law. But thanks be to God, who gives us the victory through our Lord Jesus Christ. Therefore, my beloved brethren, be steadfast, immovable, always abounding in the work of the Lord, knowing that your labor is not in vain in the Lord. Galatians 5:22-23 – But the fruit of the Spirit is love, joy, peace, forbearance, kindness, goodness, faithfulness, gentleness and self-control. Against such things there is no law. You are the Master-planner and I will be obedient to Your call, as I continue to persevere for increase. I will not quit because You are my God and in You I rely. All these mercies I ask and pray in the name of our Lord and Saviour, Jesus Christ, who died so I may have LIFE! 2 Peter 1:5-7 And beside this, giving all diligence, add to your faith virtue; and to virtue knowledge. To knowledge temperance, and to temperance patience. And to patience godliness. To godliness brotherly kindness, and to brotherly kindness charity.